I haven’t been on the diet/exercise wagon in the last few weeks. Between looking after Maddy every day and getting back into a Sudbury lifestyle I just haven’t felt like it. I’ll go back, I’m not done, I promise! But I have enjoyed this time off. And I haven’t been lazy either, trust me that kid runs me down. Also, Krys and I have decided to get a hobby. DIY stuff! I’ve always wanted to *make* stuff but have always lived where that isn’t possible. Now that I have a yard and have access to a lot of tools (thanks, Ron!) I decided to do the projects that I had in mind. 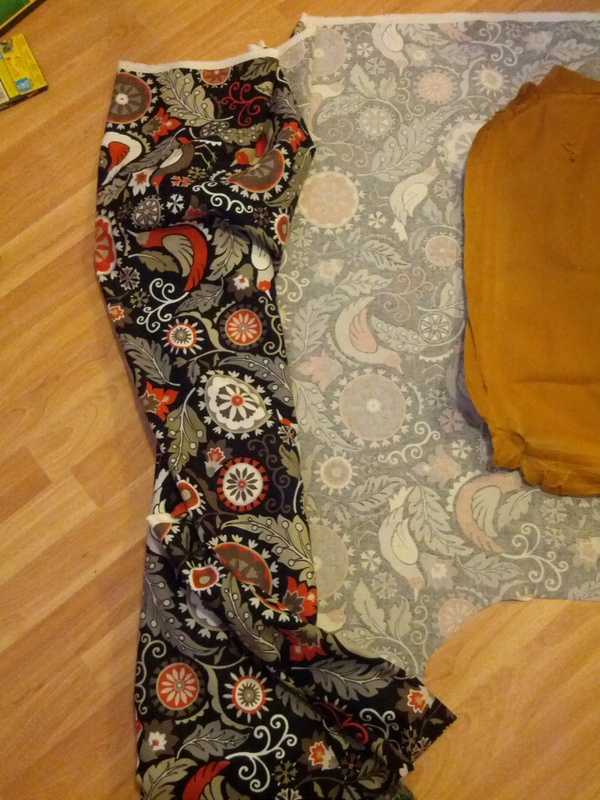 But real leather is expensive, so we went the cheap route, faux-leather. 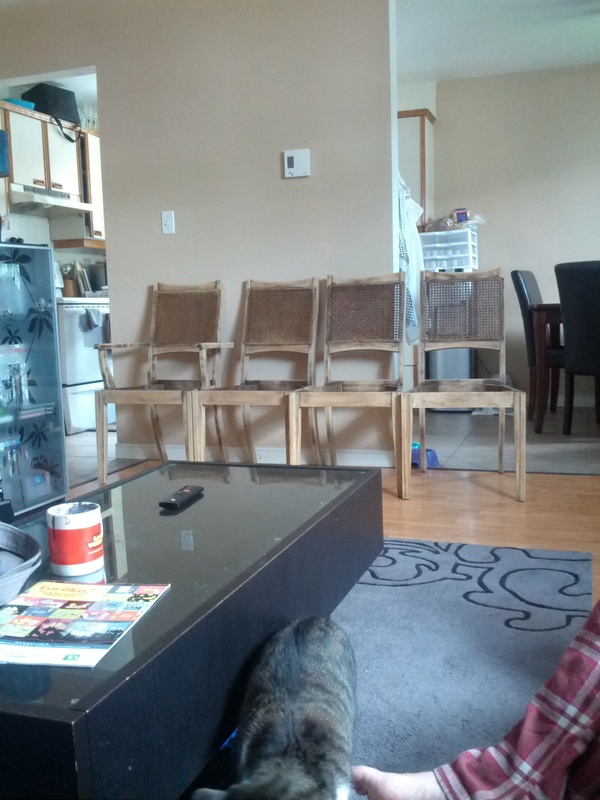 Our chairs look basically identical to the ones pictured and we’ve had them for about 5 years now. The problem is that both our cats really loved scratching them up. At first we tried to deter them but eventually gave up and let them go for it. 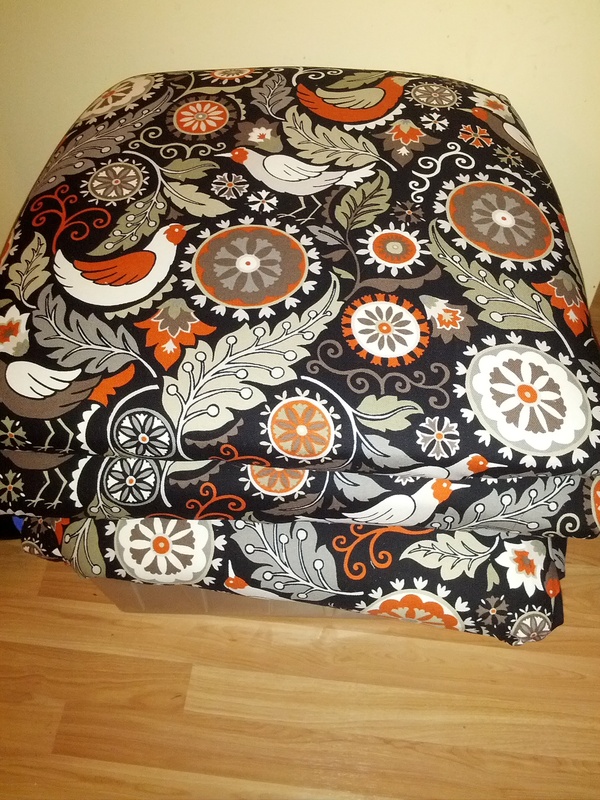 I tried to slip cover them but the cats didn’t care at all and kept right on scratching. It’s a good thing we went dark because they are so scratched up that if they were light chairs it wouldn’t look like a chair at all. Needless to say, I hate these chairs. Not only have they been destroyed (which I can live with because I love my cats) they are incredibly uncomfortable. 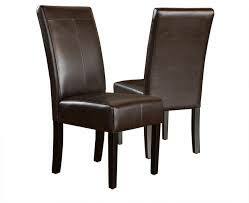 They aren’t solidly built, the legs move around, they aren’t wide enough, and they feel flimsy. So. 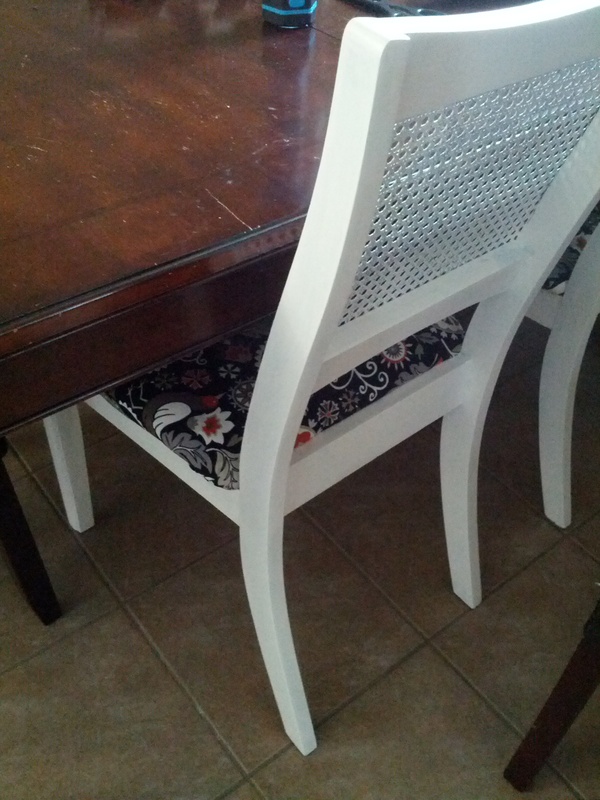 I’ve wanted new chairs for my super nice table for a long time. Finally, after weeks of searching Kijiji and yard sales, I found someone who was selling 4 in the style I thought I wanted and for a really good price. Krys and I went to check them out and at first I wasn’t going to get them. But then I sat in one. So damn sturdy. You think I’m joking, but that’s the real reason I decided to get them. They were incredibly sturdy and I was sitting on one on an uneven driveway. I knew they were going to be a lot of work. The lady suggested I just re-upholster but the stain just didn’t do it for me. Too dated looking. I Google searched for a few days and finally decided to paint them green or blue. 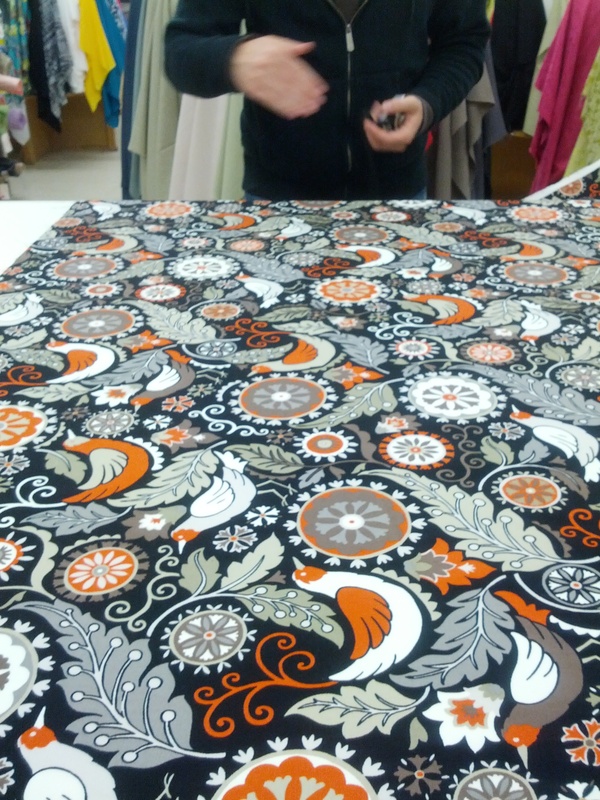 When we went to Fabricland, though, I couldn’t find any fabric I liked that would compliment those colours. So I had to let that idea go and instead I found fabric I liked and decided to paint them white. I really liked how bold the pattern was, but not too colourful. We bought 2 meters for $6 dollars. 6!! Fabricland was having a massive moving sale. Afterwards we bought the paint. 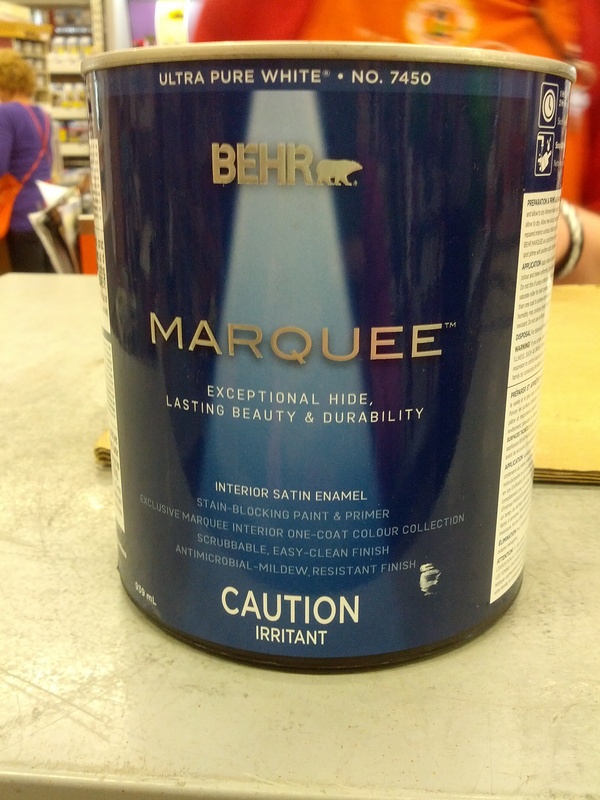 The guy at Home Depot suggested a paint that wouldn’t need a primer and was $30. 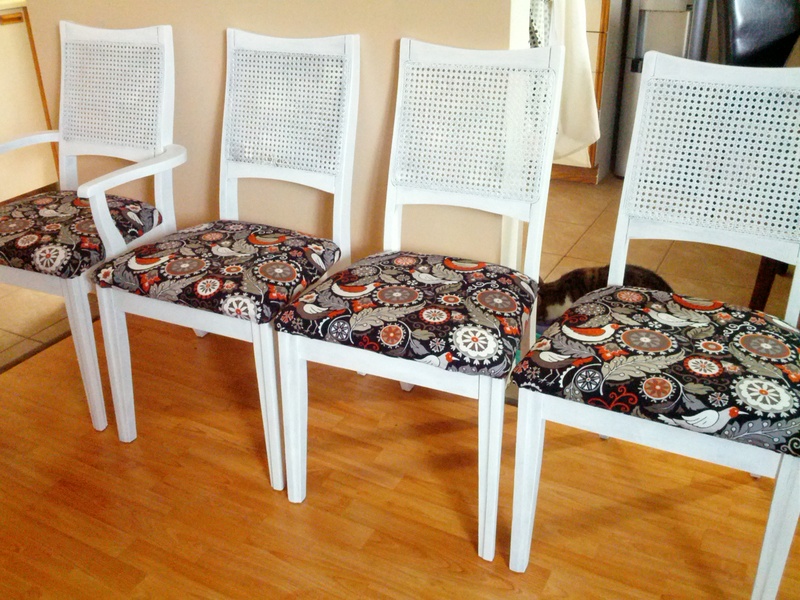 It was the most expensive thing I had to buy for this project, but I have a lot left so maybe I used about $4 for all 4 chairs. We decided to go ahead and re-upholster the chairs the day before we got to work on the hard part. Krys has fabric scissors. I recommend getting a pair. 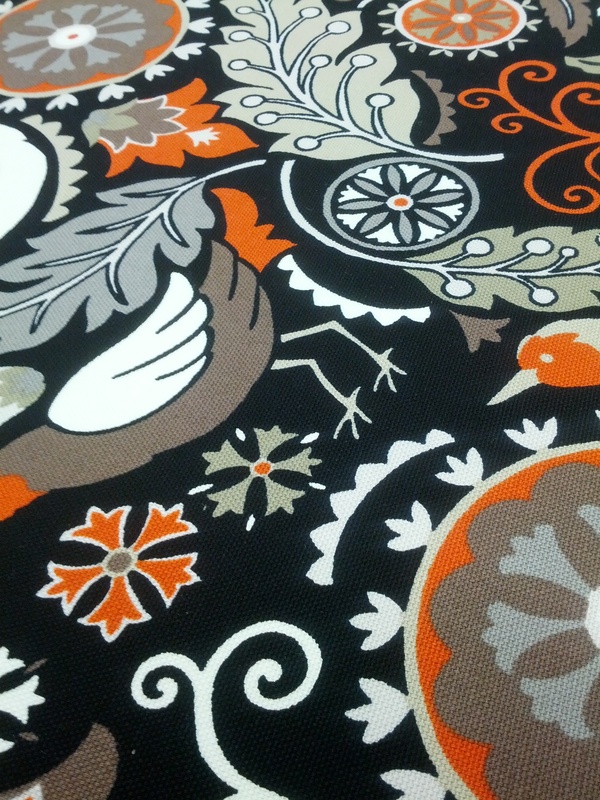 They are worth it not fraying your fabric as you cut. 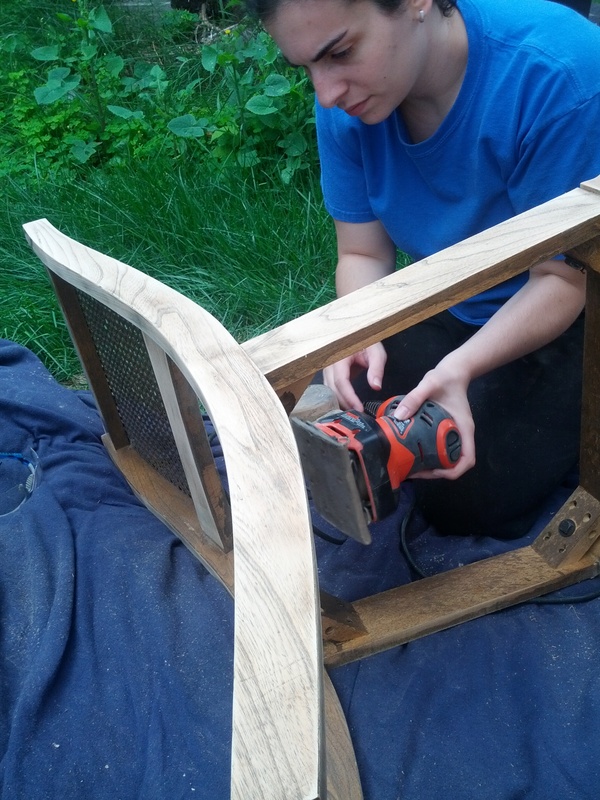 Krys and I got to work sanding. It took….. a while. I thought we would sand and paint in 1 day but sanding is exhausting. We sanded for about 2 and 1/2 hours. Our arms were dead. 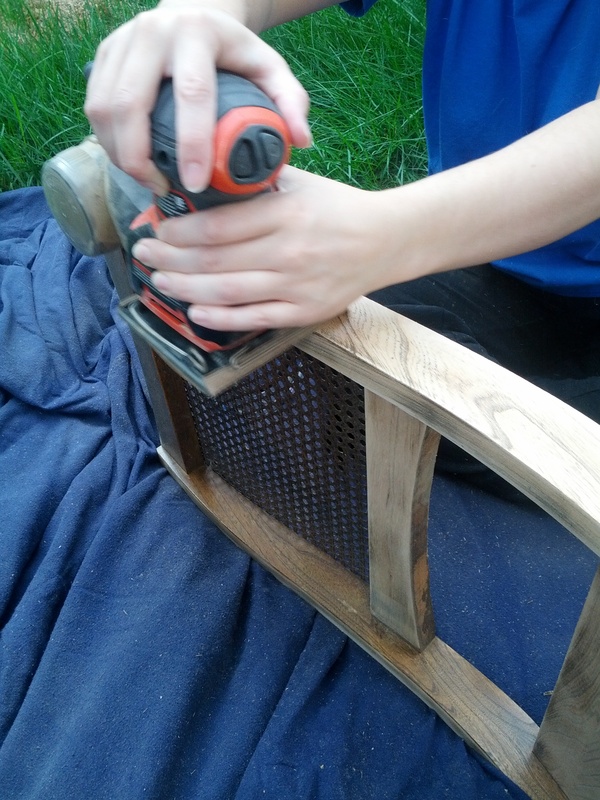 We had to change the sanding paper so many times because the stain was really in those chairs. Luckily we both had portable sanders. For the hard to reach spots we hand sanded. 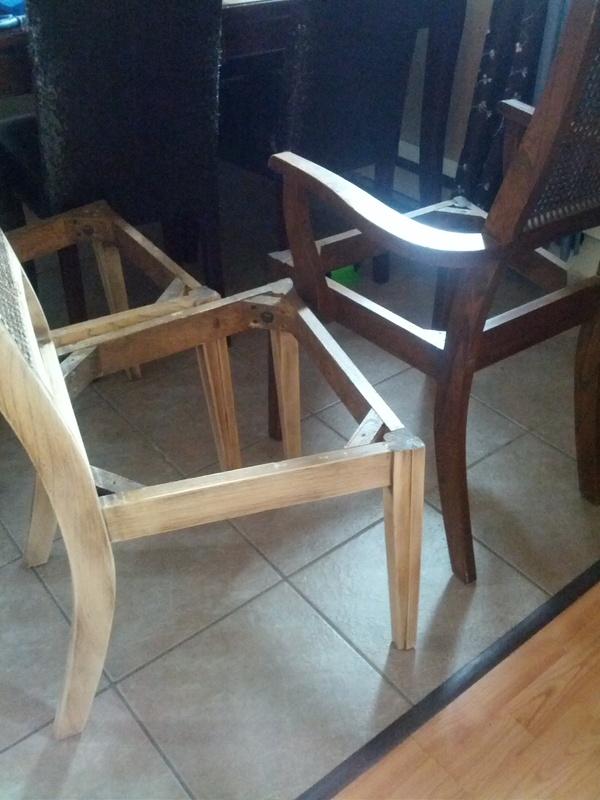 You can see the damage my cats have done to my current chairs in the background. Next step we painted. A week later, that is. Painting didn’t take long, I was worried about the wicker part because we couldn’t really sand that without destroying it, so we just left it stained. The paint stuck to it just fine, so we were thrilled. I highly recommend you get a motivated sister who also wants a hobby to help you. 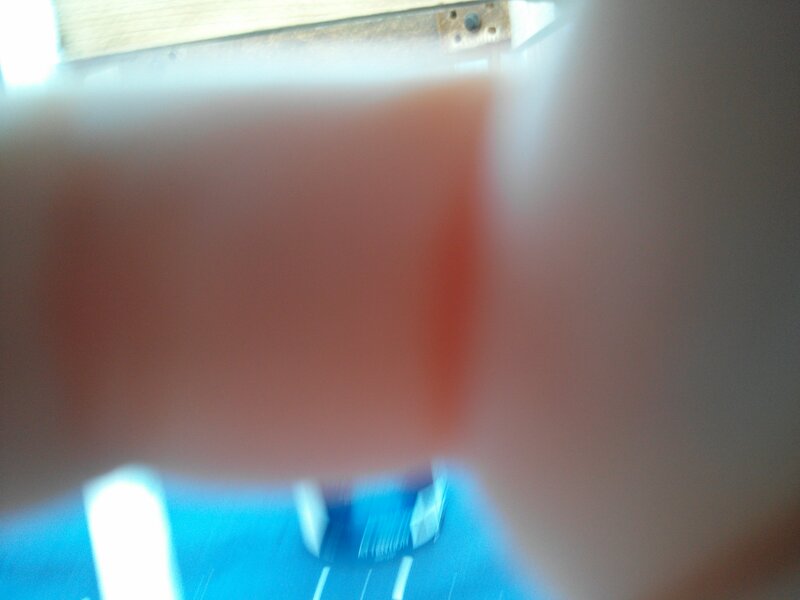 I also recommend you let your 3 year old niece try to take photos for you. The paint I bought only required 1 hour to dry but I let it dry about 6, I didn’t want to mess up. Dave helped me put the chairs back together. 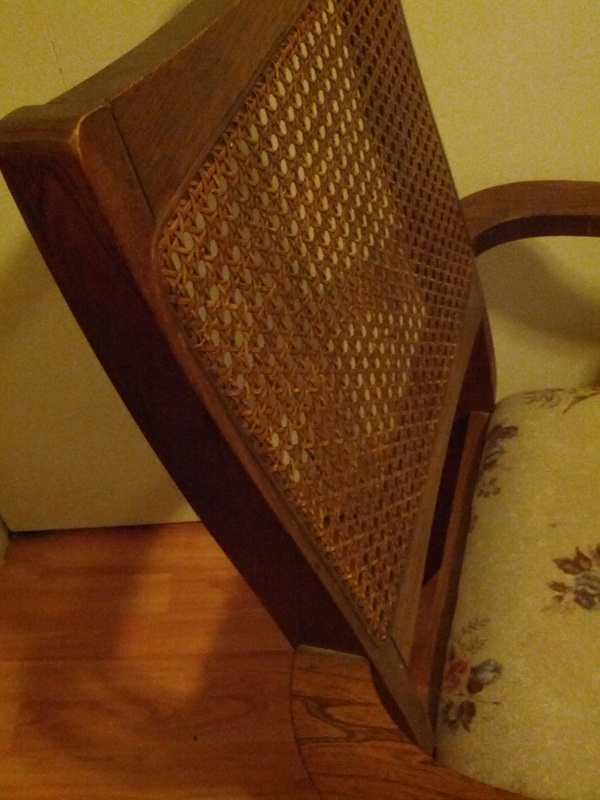 It was then that I realized we had forget to leave room around the drilled holes to put the chairs back together. Oops. I had to cut a bunch with regular ol’ scissors and that was the worst part of this whole thing. 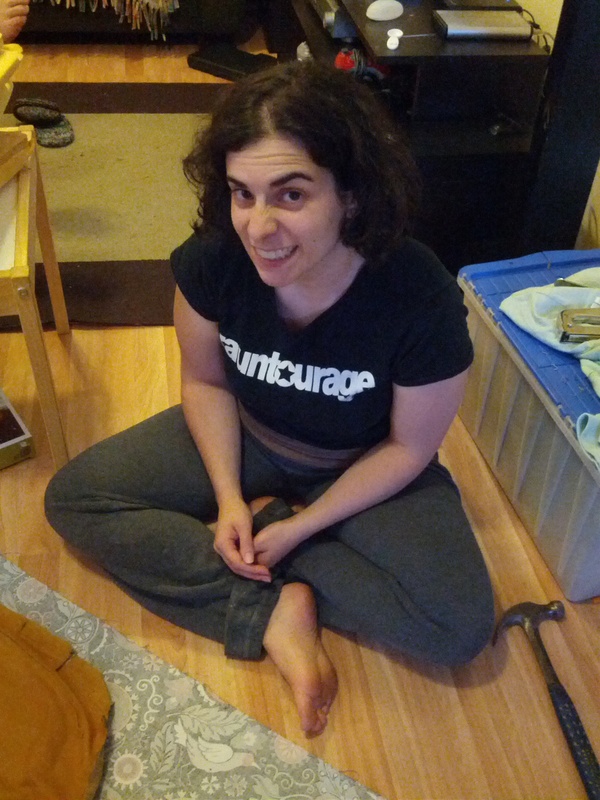 Next time I re-upholster something I’m going to make sure to cut around the holes before I even staple it. I love them. I’m very happy with how they turned out. We kept 2 of the old chairs for the cats. 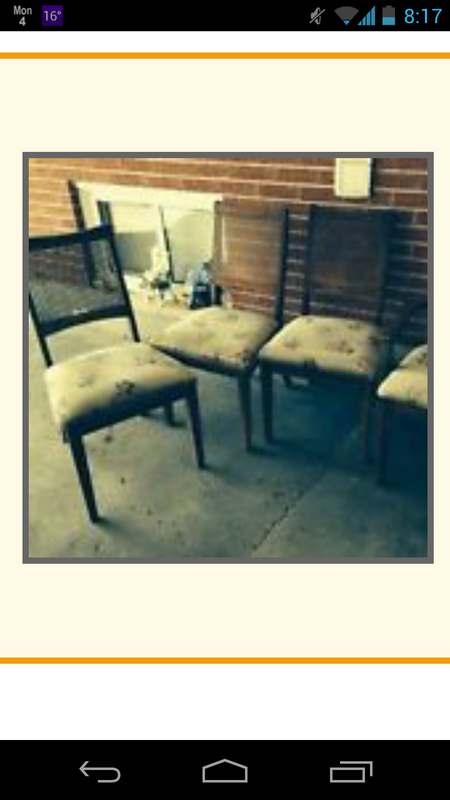 I don’t want them to feel like they should scratch my new chairs. 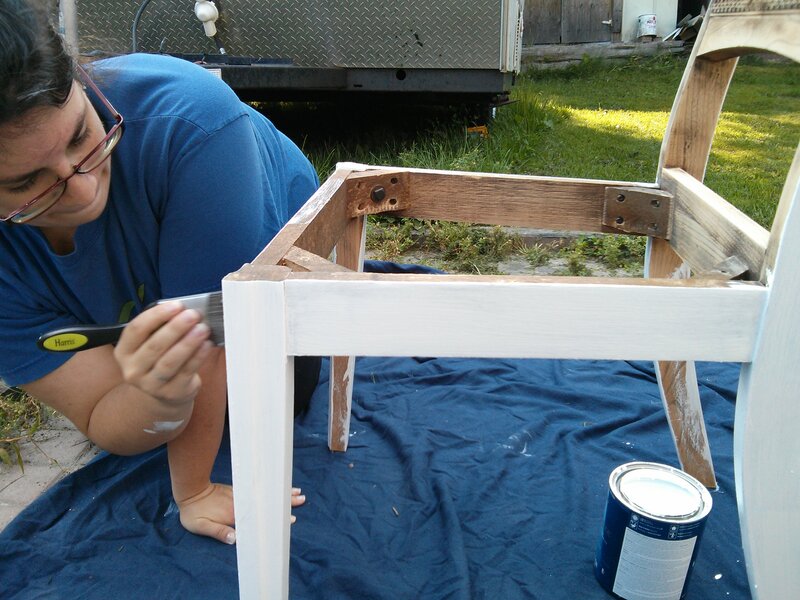 I ended up spending around $6-7 a chair when you factor in how much paint I actually used. I would definitely do this again. It didn’t take too long, just make sure you have the right tools (and family to help) for the job. Our next projects? 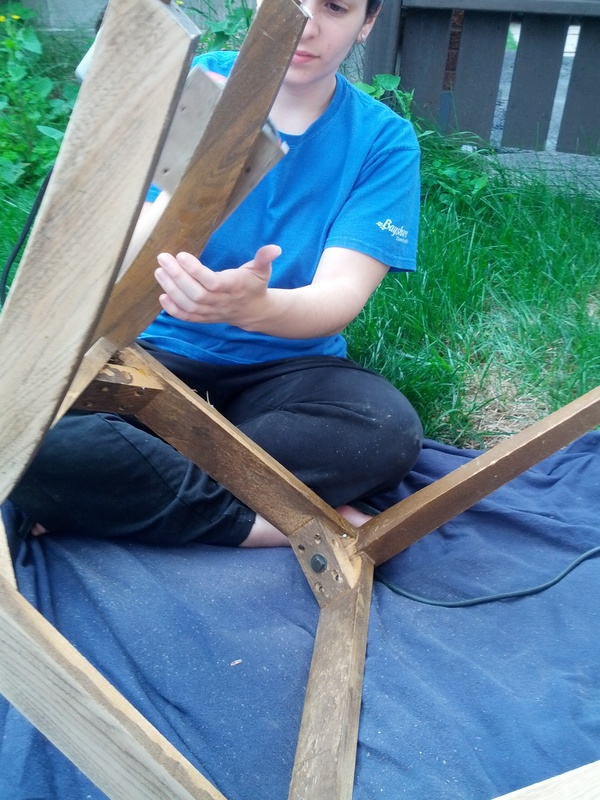 We’re going to sand (noooooo) and stain her deck furniture and then tackle a headboard for my spare room. Stay tuned!